Anyone who makes genuine effort with systematic study is sure to clear the UPSC exam. It doesn't really matter which field or stream you're from. If you appear for any of the papers of the Civil Services Preliminary Exam, your attempt is counted. But, if you have only filled up the UPSC application form and didn't go to take the Preliminary Exam, your attempt will not be counted. Q. 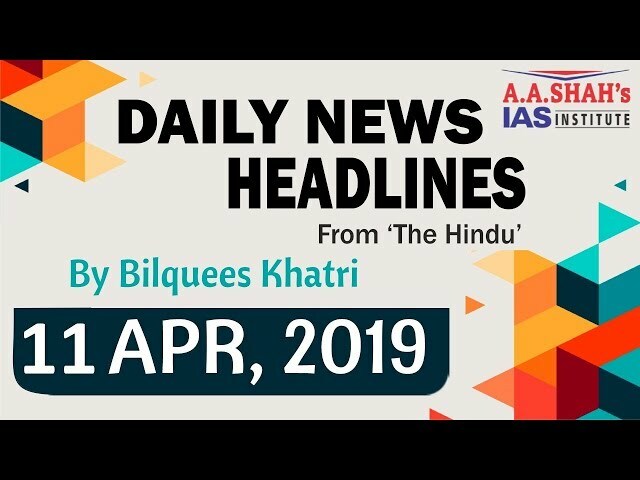 What are the details of 'Nationality' criteria for UPSC-IAS Exams? Q. What are the lower and upper age limits for UPSC - CSE? Q. What are the educational qualification required for UPSC - CSE? Q: How many attempts a candidate can have for UPSC - Civil Services Exams? Q: Are Charted Accountants eligible for UPSC - CSE ? Q What is the structure of UPSC Civil Service Prelims Exam? Prelims exam is objective in nature based on multiple choice questions. There will be two papers – 200 marks each. Paper 2 – Civil Service Aptitude Test. (iii) Details of the syllabus will be provided in the Examination Notice and Gazette Notification published by the Government. (iv) Each paper will be of two hours duration. For selection to the main exam, only marks of Paper 1 will be counted, provided the candidate has qualified in Paper 2 with 33 percent (i.e. 66 marks). Q Will there be an individual cut-off for two papers in Civil Service Prelims? The minimum cut off marks for Paper 2 is 33 percent which is qualifying in nature and the cut off for Paper 2 is decided by the Commission every year. Q. Is there negative marking at Civil Services (Preliminary) Examination? Q. In Prelims exam, which is the language / medium of question papers? Q. 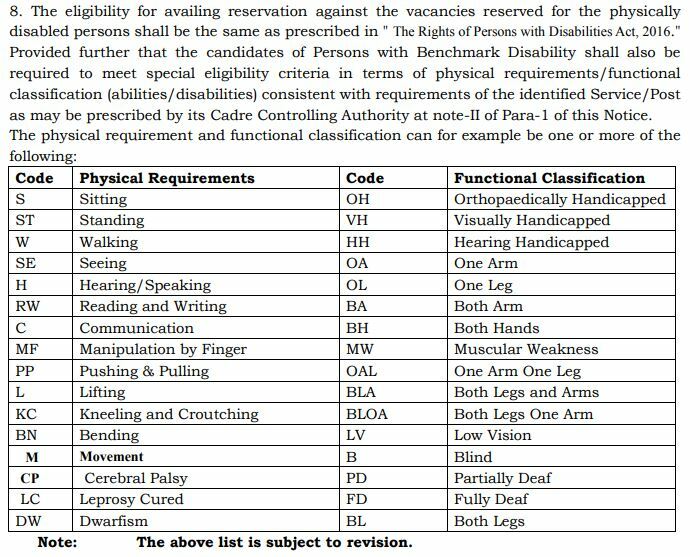 Are subject-wise/ paper-wise marks of each candidate made accessible/ available to him/her for Civil Service (Preliminary) Examination? Q. Can I know the question-wise marks awarded to me for a paper? In a competitive examination, what is relevant is not the absolute performance of a candidate, but his her relative performance that in fact determines whether the candidate qualifies and, if so, his/her position in the merit list. Accordingly, as already explained above, the evaluation process does not end after initial evaluation by an Examiner. Moderation, wherever applied, is on the total award initially given (the so-called raw marks) and not on question-wise basis. Therefore, once the evaluation process is complete, neither raw marks nor question-wisemarks subsist. What subsists is the candidates total score in a paper awarded at the end of the evaluation process and this award is normally made available to the candidate in due course (a month or two) on the Commissions website. Q. What is the structure of UPSC Civil Service Mains Exam? 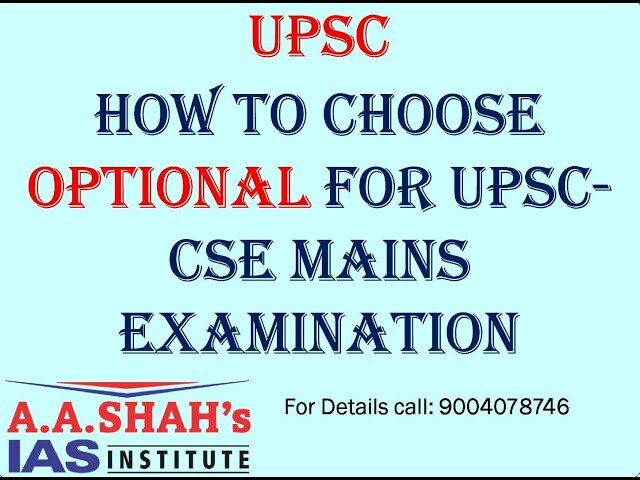 Qn: Which optional subject should I choose for UPSC Mains? The Main Examination will consist of written examination and an interview test. The written examination will consist of 9 papers of the conventional essay type. Two papers (out of 9) will be of qualifying in nature. Marks obtained for all the compulsory papers (Paper–I to Paper-VII) and Marks obtained in Interview for Personality Test will be counted for ranking. Q. 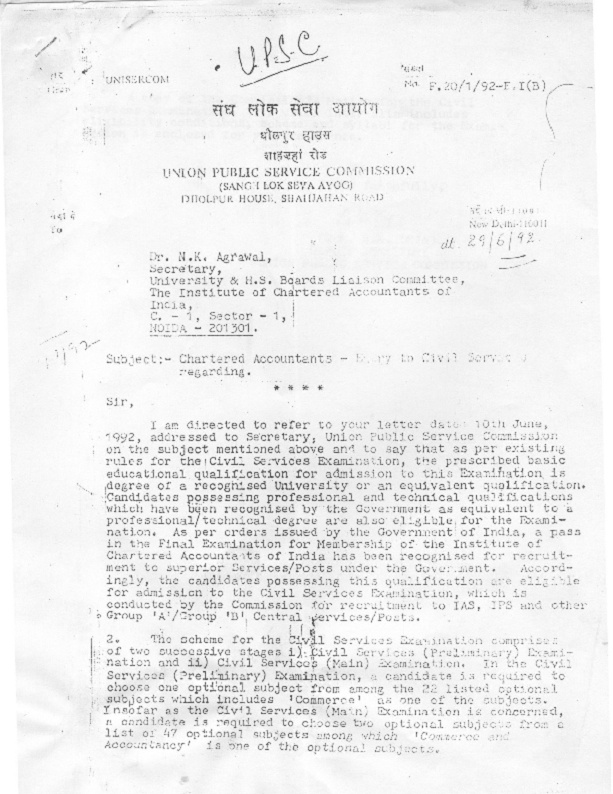 Will there be minimum qualifying marks for UPSC Mains Compulsory Papers? English language – compulsory for all candidates. Regional (Indian) language – compulsory for all candidates except those hailing from Sikkim, Arunachal Pradesh, Nagaland, Manipur, Mizoram and Meghalaya. Both the papers are for three hours and make up a total of 300 marks each. Candidates have to score at least 75 marks (25%) in both these papers to qualify. Q. Will UPSC deduct marks for bad handwriting? Q. What are the check-list items for Mains Exam hall? Q. Can a candidate choose an optional subject, which he has not studied at graduate/post graduate level? Q. In Mains exam, which is the language / medium of question papers? Q. Can a candidate write different papers of Civil Service (Main) Examination in different languages? Q. How are the Question Papers for the Civil Services (Main) Examination structured? What is the duration of each paper? Q. Can a candidate write the Civil Service (Main) Examination in English and take the interview in Hindi or any other Indian language? The candidates, opting for Indian Language medium for the written part of the Civil Services (Main) Examination may choose either the same Indian Language or English or Hindi as the medium for the interview. The candidates, opting to write the Civil Services (Main) Examination in English, may choose either English or Hindi or any other Indian Language opted by them for the compulsory Indian Language Paper in the written part of the Civil Services (Main) Examination, as the medium for interview. The candidate has to indicate the language medium of their interview at the time of filling up of the Detailed Application Form (DAF) However, the candidates, who are exempted from the compulsory Indian Language Paper, will have to choose either English or Hindi as medium of Interview of Personality Test. Q. What are the Cut-off Marks for the compulsory language Papers? Q. Is the Indian language Paper compulsory for candidates hailing from the States of Arunachal Pradesh, Manipur, Meghalaya, Mizoram, Nagaland and Sikkim? The paper on Indian Language (Paper A) will not be compulsory for candidates hailing from the States of Arunachal Pradesh, Manipur, Meghalaya, Mizoram, Nagaland and Sikkim. Q. What marks are reckoned for merit ranking in the written part of the Civil Services (Main) Examination? Q.Is it likely that my evaluated performance suffers because my answer books were evaluated by a ‘strict’ examiner, while another candidate benefits as his answer books were evaluated by a liberal examiner? Q. After the written examination, on what criterion is the answer books sent for evaluation? Is it on Roll no. basis or based on centre of examination? That is, will a particular examiner/ set of examiners get to evaluate answer books only of a particular centre or a particular group of roll numbers? Q. Can a candidate write the Civil Services (Main) examination in English and take the interview in Hindi or in any other Indian Language? Level? Q. Can you provide a check-list for the candidates attending UPSC interview? We advise all candidates to please re-check the documents with official UPSC website each year. Q. Will there be minimum qualifying marks for UPSC Interview? The interview will carry 275 marks with no minimum qualifying marks. Q. Does AA Shah offer free study materials?